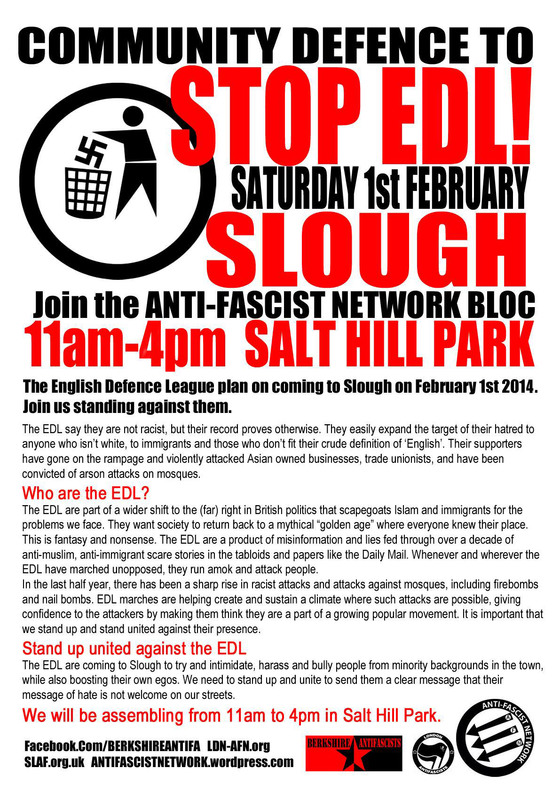 London Anti-Fascists, South London Anti-Fascists, Berkshire Anti-Fascists and the Anti-Fascist Network invite you to join us in Slough on 1st Feb to counter the first EDL demo of 2014. 2013 was the year the EDL leadership quit, leaving the still-twitching headless corpse to stumble on blindly. This zombie racist rabble is descending on Slough in February. Let’s start the year as we mean to continue and make 2014 the year we bury them for good. The EDL demo is against a new mosque development that has been given the go-ahead by the council. To local concerns about car parking the EDL have added their own unique brand of virulent racism and bomb threats to help the planning process along. Everyone knows they are parasites who latch on to any proposal for a mosque or Muslim community centre anywhere and take it as an excuse to descend on the town and ratchet up any pre-existing community tensions in the hope of sparking the sort of anti-Muslim pogrom they so obviously desire. Everyone out for 1st Feb! 11am Salt Hill Park.